To kick off this catch report I would like to say thank you to all who have supported the fishery after the recent changes, in particular the new Catch & Release options. The majority of anglers have embraced the opportunity to spend more time at the fishery while others are enjoying the experience of fishing Exe Valley without the need to kill what they catch. 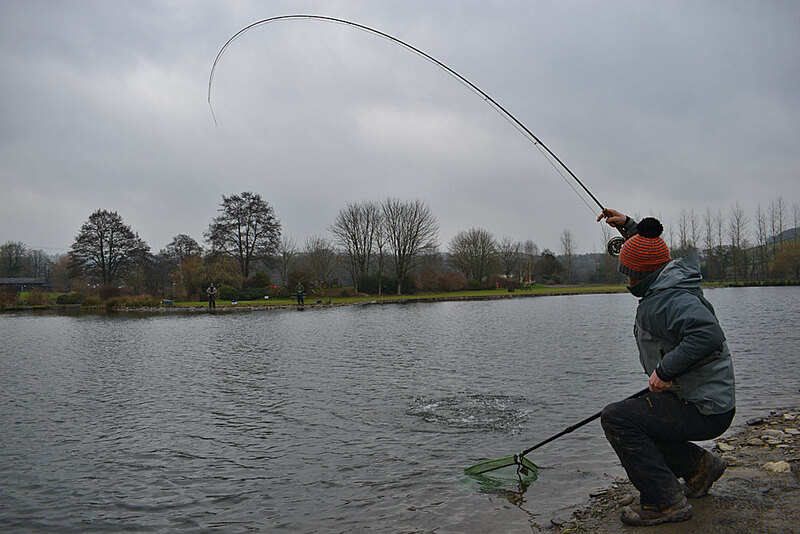 We kicked off on 7th Feb with nobody here but the following day 11 anglers turned up and to today (22nd Feb) we have welcomed 67 of which 12 went for the full C&R option. Rob Wilkinson from Exeter released 8 and said in his comments “C&R is a great idea”. Phil Frapple from Taunton released 10 commenting “Good Day, Fish all went back safe & sound” Mr Morgan from Newton Abbot also got 10 and Danny Ford released 7 to 8lbs although unfortunately I was not there with the lens for that fish! However he did very kindly allow me to take a sequence of shots which shows perfect catch & release practice. Rubber mesh nets are used to ensure fish welfare. Available for loan if required. Unhook fish in the water, barbless hooks only are allowed (not debarbed) Fish must be given time to recover. If a photograoh is required these must be taken with the fish held over the water. Never drag a fish to be released on to the bank! A well handled Trout which has been given time to recover will swim away strongly. The 67 anglers caught a total of 265 fish to take the rod average to 3.9 with 109 fish released to fight another day. Several anglers including Chris Heal (3 Fish weighing 7lb 8oz), Paul Winterson (4 Fish weighing 12lb 8oz), Ian Nadin (5 fish weighing 21lb), Bob Turner(4 Fish weighing 11lb), Dave Bull (3 Fish weighing 10lb), Rod Lawrence (3 Fish weighing 11lb), John Clarke (3 Fish weighing 12lb), Jenny Harris (2 Fish weighing 6lb) & Rosie Coles (2 Fish weighing 6lb) all caught there limit bags prior to releasing. A helpful set of guidelines has been produced to assist people when Catching & Releasing, to ensure the welfare of the Trout. Barbless hooks and Rubber Nets are obligatory, there is a good stock of flies now in store and we can loan nets to those who only have regular material mesh. Amongst the fish we have had some real crackers on a host of different tactics although a Hot Head or Blue Flash Damsel has been particularly successful. Buzzers & Diawl Bachs are also working very well and there is no need to cast them into the middle of the lake. I had the pleasure of spending several days on the lakes myself last week hosting fly fishing courses and both Andi Avery & Blair Woodland caught using heavy tungsten Buzzers fished in the deep water opposite the feeder stream. New to the Sport. Andi Avery caught a total of 9 Trout during his visit using Tungsten Buzzers. Making up part of Andis limit bag prior to releasing was this double that we stalked in the deep water in the corner of the lake. The competition will be fished to a 6 fish kill only limit with a maximum of 2 fish per peg. Anglers will move pegs every 30 mins and the competition will be decided on weight plus a time bonus if applicable. Please note that if as a competitor you have not completed your limit you will be able to fish on after the match and for those who have completed a limit you may return to fish on a catch & release basis up to 4 more fish. As always thank you for reading and if you are thinking about heading over to fish please call us on 01398 323008 for help & assistance. Plus you can also Find Exe Valley Fishery on Facebook Here.